This is our 1969 Mobylette Motobecane SP93. 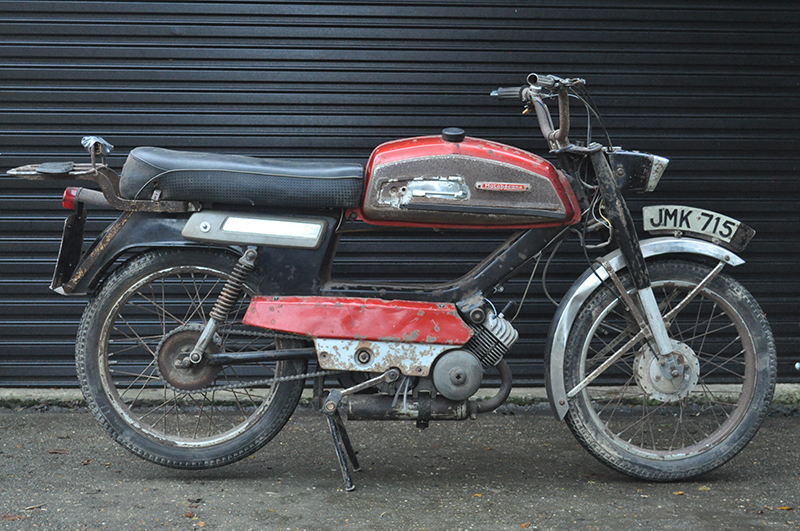 Thought to have come from a collection of up to 30 French mopeds stored in a barn in France. Brought back to Suffolk, the condition seemed worse than we thought, with tin-work being the main concern for our in-house plating plants. Despite having low production numbers in late 1960's early '70's, many Mobylette parts could be sourced from French suppliers such as VSX, being one of the only "Top-Tank" production Mobylettes - that was very surprising!! Being the SP or "Sports/Speciale" model, this moped shared a lot of similarities with the Motobecane AV88 which appeared in 1958... This Moped packs in some interesting engineering which made it an interesting build for us. Having a complex belt driven "DI-MOBY" double automatic gearbox, clutch and variator drive train; and a 50cc single cylinder air-cooled 2 stroke, packing 2HP. With a complete top end engine rebuild with Polini spec parts, this Mobylette runs like a charm! The predecessor, the Motobecane AV88 sold 12 million in their entire production - making them well-known for "Robust design and a great standard of finish". Mobylette started producing Moped's under the Motobecane name in 1949. "Moby" then went on to enjoy over 45 years of healthy production figures before being cut short in 1981 when they filed for bankruptcy. 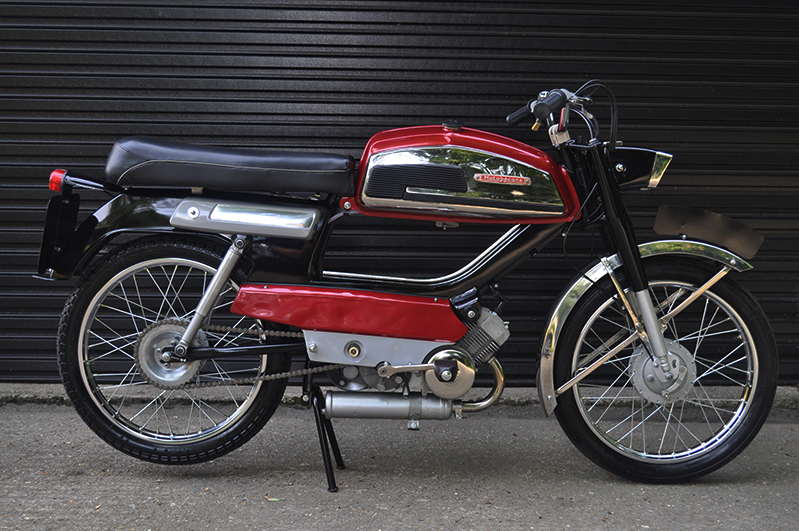 The well-deserved restoration of this 1969 Mobylette SP93 makes for a nice collectable or investment, with numbers slowly deteriorating it will be hard to find one to this standard of finish. With many original features rekindled with chrome plating, brings this Mobylette back to its original condition. Just like all of our bikes, all consumables are swapped out to give you a near new experience; Brake shoes relined with a more modern composite which allows braking from cold temperatures to all new bearings being replaced with new. Wheels built with French made rims and stainless spokes with glass peened hubs to complete the look! The Mobylettes pressed steel frame supports a brand new wiring loom, fuel lines and control cables. Many original parts professionally refurbished, the Huret Speedometer sporting a re-chromed bezel to the upholstered seat. £1995 - Viewing always advised / Part Exchange Considered.